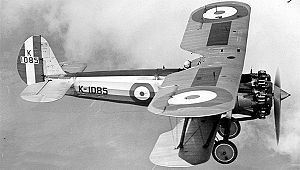 The Bristol Bulldog was a British Royal Air Force (RAF) single-seat biplane fighter designed during the 1920s by the Bristol Aeroplane Company, with over 400 Bulldogs produced, that arguably became the most famous aircraft during the RAF's inter-war period. In September 1926, the Air Ministry stated a need for a single-seat fighter capable of operating in day and night-time conditions; to be armed with two 0.303 in (7.7 mm) Vickers machine guns and to be powered by an air-cooled radial engine. This requirement was laid down in Specification F9/26. The Bulldog was designed by Frank Barnwell, the Chief Designer of the Bristol company, (who had served as a Captain in the British Army during the First World War), as a private venture to meet the requirements of this specification. The prototype Bulldog, the Bulldog Mk. I first flew on 17 May 1927. After initial consideration of all the types entered to meet the specification, the Bulldog and the Hawker Hawfinch were selected for more detailed evaluation. While the Bulldog's manoeuvrability and strength were praised by the RAF, it initially had poor spinning recovery properties and was therefore fitted with a lengthened rear fuselage. In this form, it was declared the winner of the competition, having slightly superior speed and was easier to maintain, and required fewer changes to produce an operational aircraft than the Hawfinch. The full-production Bulldog came in the form of the Mk.II, which had a modified structure but in every other respect was identical to the original Bulldog; having two 0.303 in (7.7 mm) Vickers machine guns; a capacity for four 20 lb (10 kg) bombs; a 450 hp (340 kW) Bristol Jupiter radial engine; giving the Bulldog a maximum speed of just under 180 mph (290 km/h) and a range of 300 mi (480 km). The aircraft then entered production in 1928, entering service the following year, and becoming, during the early 1930s, the most widely used aircraft in the RAF. It was cheap to maintain and thus, at a time of defence budget constraints, was the more preferable option to any other competitors. The Mk. IIA was again virtually similar to its predecessor, though it had a new Jupiter engine and a strengthened structure. The Bulldog proved to be quite a successful export to foreign air forces, seeing service with Australia, Denmark, Estonia, Finland, Japan, Latvia, Siam, Spain and Sweden. The Bulldog was withdrawn from RAF service in 1937, being replaced by the Hawker Hurricane and Supermarine Spitfire, both of which would become legends of the RAF for their contributions during the Second World War. The Bristol Bulldog's career was not over though, for the type continued to serve with other air forces. The Bulldog never saw combat with the RAF, though during the Abyssinia Crisis of 1935-36, Bristol Bulldogs were sent to the Sudan to reinforce Middle East Command. Douglas Bader, better known for his Second World War actions, lost both of his legs when his Bristol Bulldog crashed while he was performing unauthorised flying Aerobatics at Woodley airfield near Reading. In 1936, Latvia, keen to replace its elderly Bulldogs with more modern aircraft, sold eleven Bulldogs to Basque nationalist forces fighting the Spanish Republicans in the Spanish Civil War, remaining in use until the Battle of Santander. 19 Bulldogs also saw combat as part of the Finnish Air Force during the Winter War against the Soviet Union, which began in 1939. The Bulldogs fought well against their Soviet opponent, gaining six kills by five pilots for the loss of one of their own, the types shot down being two Polikarpov I-16s and four Tupolev SBs, both of which were quite superior in terms of technology compared to the Bulldog. 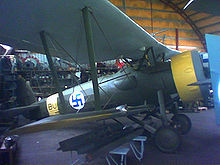 In fact, the very first aerial victory of Finnish Air Force was achieved by a Bulldog piloted by SSgt Toivo Uuttu on 1 December 1939, over an I-16. The Bulldogs were used in advanced training during the subsequent Continuation War against the Soviet Union. Single-seat day and night fighter prototype; 2 built by Bristol Aeroplane Co.
Single-seat day and night fighter version. Powered by a 440 hp (330 kW) Bristol Jupiter VII radial piston engine; 92 built by Bristol Aeroplane. Single-seat day and night fighter version. Powered by a 490 hp (370 kW) Bristol Jupiter VIIF radial piston engine; 268 built by Bristol. Interim aircraft. Only two aircraft were built by Bristol. Single-seat day and night fighter version. Powered by a 640 hp (480 kW) Bristol Mercury radial piston engine; 18 built by Bristol. Two-seat training version; 59 built by Bristol. Two aircraft license-built by Nakajima Aircraft Works, Japan. Picture - Bristol Bulldog preserved at the Hallinportti Aviation Museum museum. No. 24 Squadron RAF - One two-seat Bulldog was used by No. 24 (Communications) Squadron. "The Bulldog Breed" Part II. Air Enthusiast, February 1973, Vol. 4, No. 2, pp. 91-95. Bromley, UK:Fine Scroll. Lx�pez, Rafael A. Permuy and Artemio Mortera P�rez. Bristol "Bulldog" (I) (Perfiles Aeronx�uticos: La Mx�quina y la Historia 8) (in Spanish). Valladolid, Spain: Quiron Ediciones, 2006. ISBN 84-96016-03-X. Lx�pez, Rafael A. Permuy and Artemio Mortera P�rez. Bristol "Bulldog" (II) (Perfiles Aeronx�uticos: La Mx�quina y la Historia 9) (in Spanish). Valladolid, Spain: Quiron Ediciones, 2006. ISBN 84-96016-04-0.